Lightweight material with high drying capacity. Ideal for drying after sports, gym, etc.. Composition: 80% Polyester, 20% Polyamide - Nylon. Now Brad Pitt, Angelina or George Clooney will be waiting you at the exit of the shower to dry off in their arms, thanks to these personalised towels. And if you think you are old enough to have a crush on movie stars, you can always personalise it with your partne´s, pet or the memory you choose. 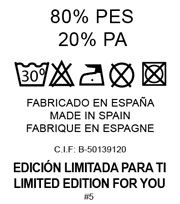 Material: microfibre Measurments are approximate and may be affected by the image transfer process.